Safe? Nuclear? No Thank You! 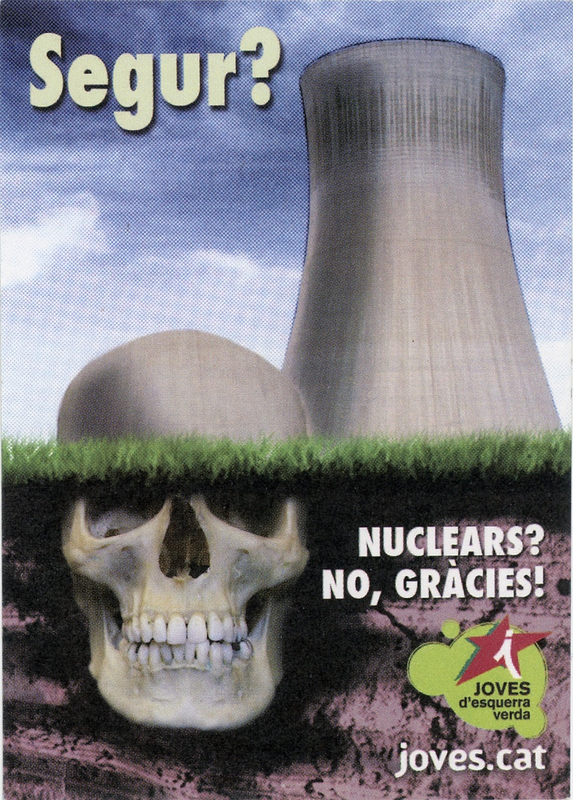 The sticker shows a giant skull that is disguised as part of a nuclear power plant. The image is split into two halves, the top being the above ground view that can easily be recognized as a power plant, and the bottom half being the below ground more abstract view of the reality of nuclear power. It was created by Joves d’esquerra verda, an environmental organization that focuses on the betterment of Cataluña. They placed both their logo and their website addresses on the sticker. Pointing out how unsafe nuclear energy can be coupled with the image of the scull, the message here is very clear and very anti-nuclear. Coming from a youth organization, this sticker reveals the worries that this generation has in regards how Spain sources their energy. Spain uses 7 power plants to generate a fifth of their total energy, but nuclear energy has a lot of repercussions that this sticker raises awareness to.